This photo was taken on Büyükada, largest of the Princes Islands off Istanbul, Turkey. I found more blue glass here in 10 minutes than I have ever found. But then started choosing waterworn pottery!! Büyükada is on the Sea of Marmara, which is part of the waterway between the Aegean Sea (Mediterranean) and the Black Sea (refer to the map below). Büyükada is only about 3 miles long with access to several beaches along the shore. 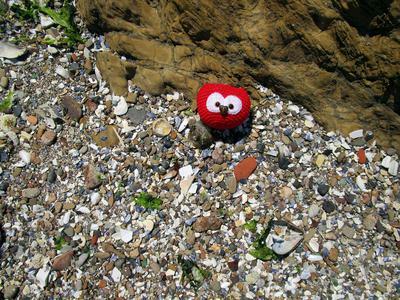 As you can see it offers intriguing possibilities for sea glass and beach pottery! 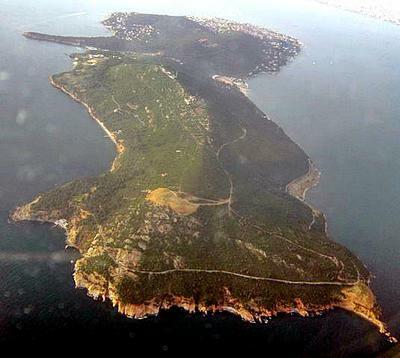 During the summer months the Princes' Islands are popular destinations for day trips from Istanbul. As there is no traffic on the Islands, the only transport being horse and cart, they are amazingly peaceful in contrast with the city of Istanbul. They are just a short ferry ride from Istanbul, with ferries departing from Bostanc?, Kartal and Maltepe on the Asian side, and from Kabatas, on the European side. In spring and autumn the islands are quieter and more pleasant, although the sea can be rough in spring, autumn and winter, and the islands are sometimes cut off from the outside world when the ferry services are cancelled due to storms and high waves. During winter, with the addition of the biting cold and the strong winds and the resulting ferry cancellations, the islands become almost deserted.